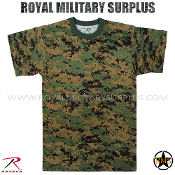 The MARPAT (Digital Woodland) Camouflage Pattern has been first introduced by the US Navy Marine Forces in 2001. 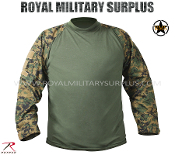 It progressively replace the US WOODLAND (M81 Pattern) Combat Uniform previously used by the United States Marine Corps in 2002. The Woodland variation of the American Disruptive Pattern Digital Camouflage was developped following a bilateral military exchange agreement sharing the Canadian Army CADPAT Camouflage Pattern Technology. 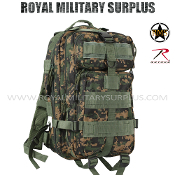 The MARPAT (Digital Woodland) is based on the Pixelization of Four-Color (Black, Brown, Light Brown & Dark Green) and it is primarly designed for Woodland, Jungle and Tropical Environments. This computer generated pattern incorporates Near Infrared protection designed to counter Night-Vision & Detection devices. Currently in use by the USMC, International Military Forces and Security Forces. 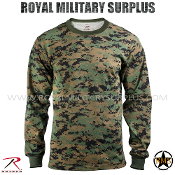 The Canada based Royal Military Surplus online store offers range of quality Military Kits, Combat Uniforms, Tactical Gear and Military Apparel in MARPAT Digital Woodland Camouflage Pattern.